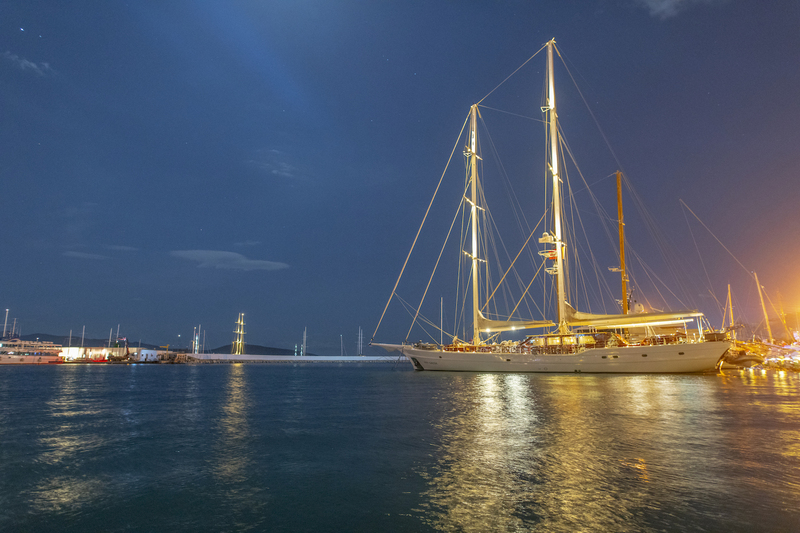 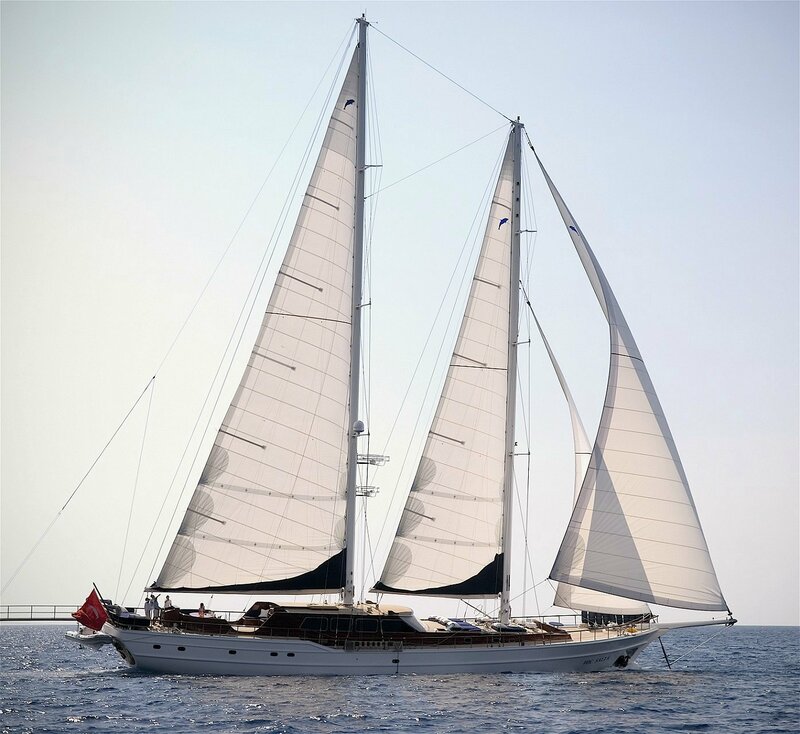 Launched in June 2006, luxury Turkish Gulet HIC SALTA is a 42.5,/139.44ft schooner This Gulet was built to highest standards, and she is a superb example of the fine craftsmanship found in this region of the world. 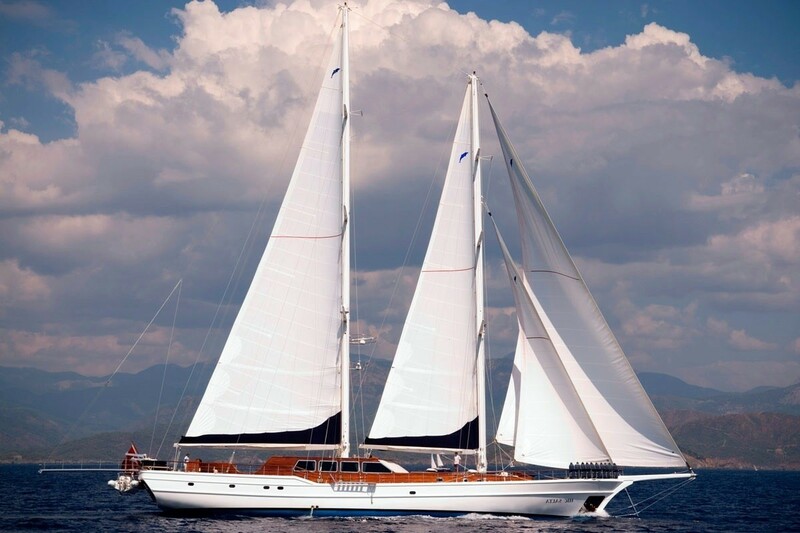 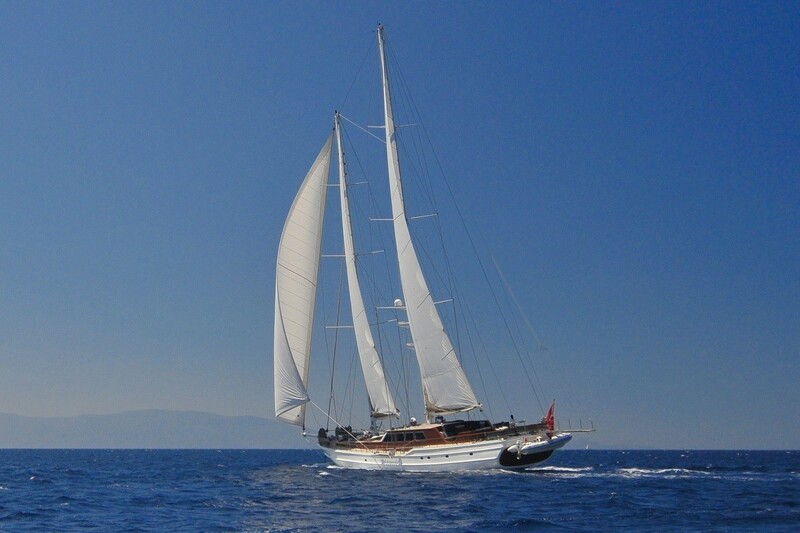 She has great potential in the charter market and can be described as deluxe. 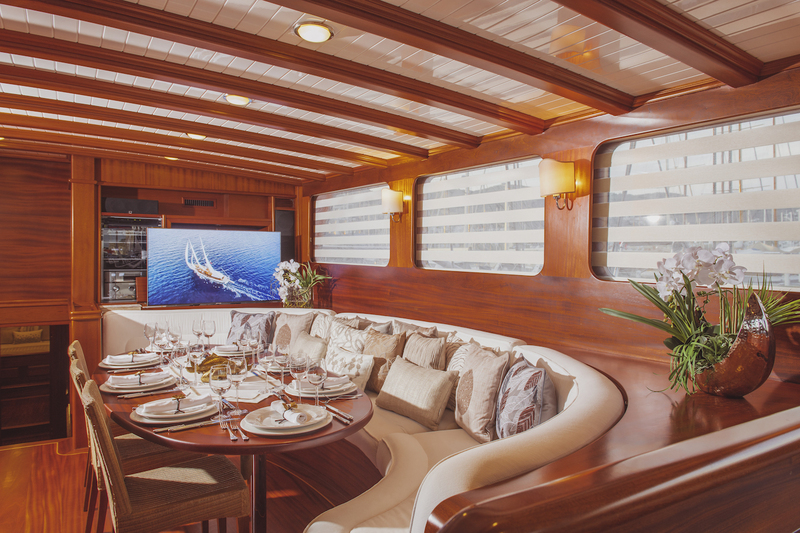 HIC SALTA’s lounge has a bar, library, TV, audio corner and dining table, as well as an inside steering station and it also gives access to the well-equipped galley. 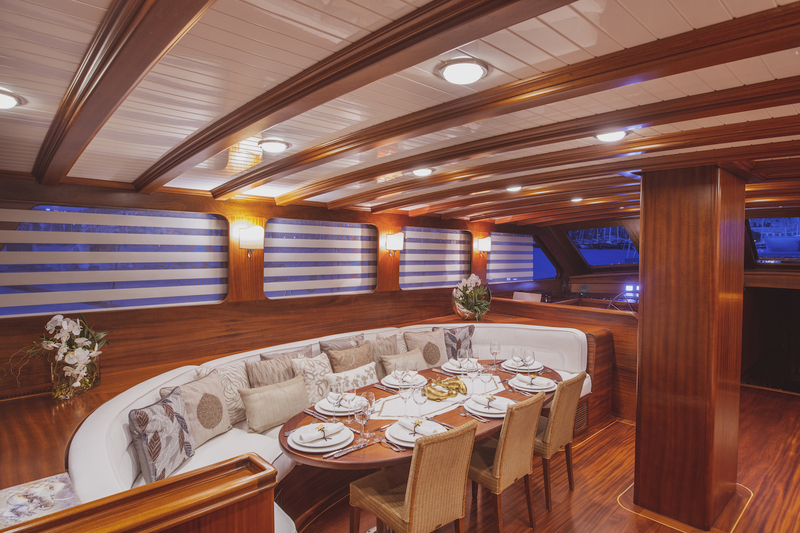 The design of the luxury yacht allows for a huge aft deck area with al fresco dining area. 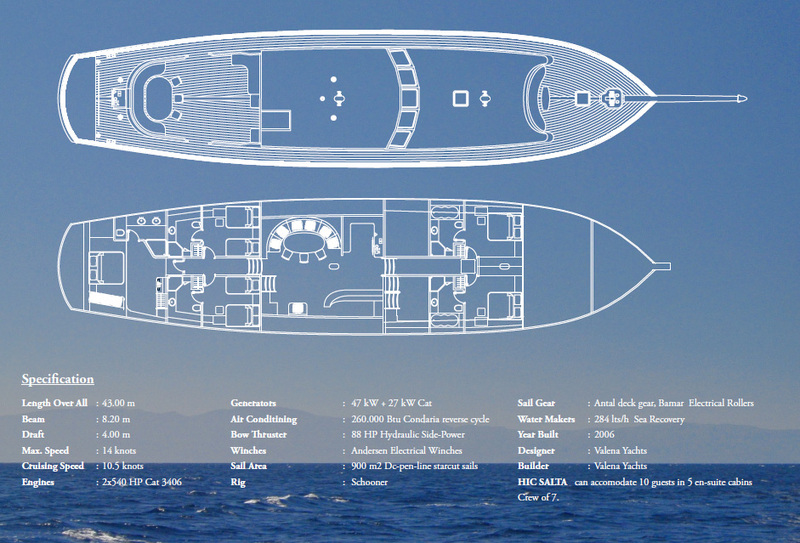 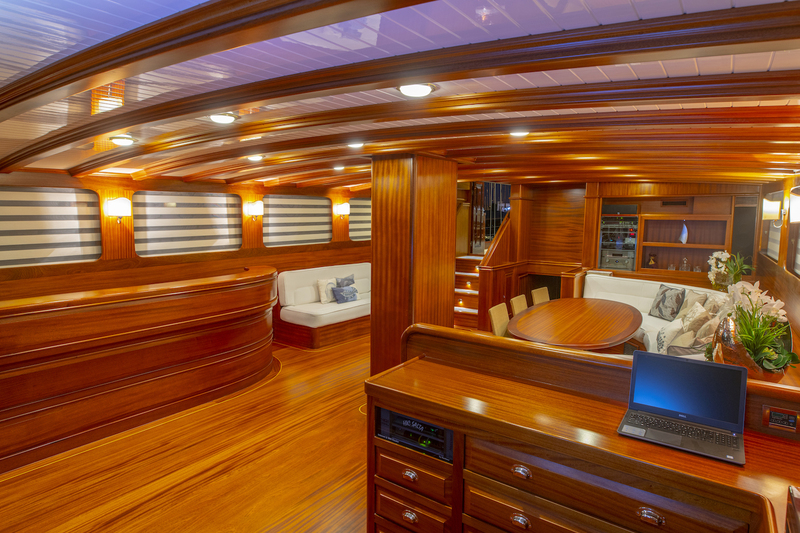 In addition to this, there is a fixed seating area on her open foredeck area. 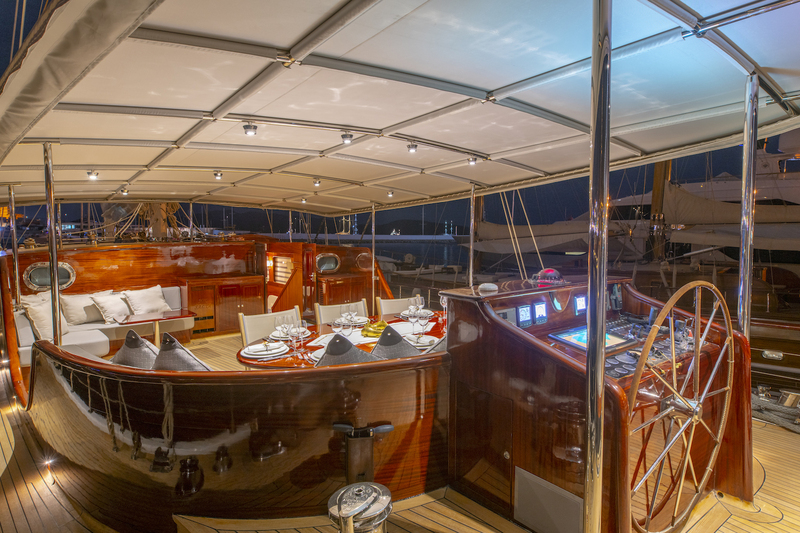 Huge sun awnings allow those guests who enjoy the shade on summer days ample space for entertainment. 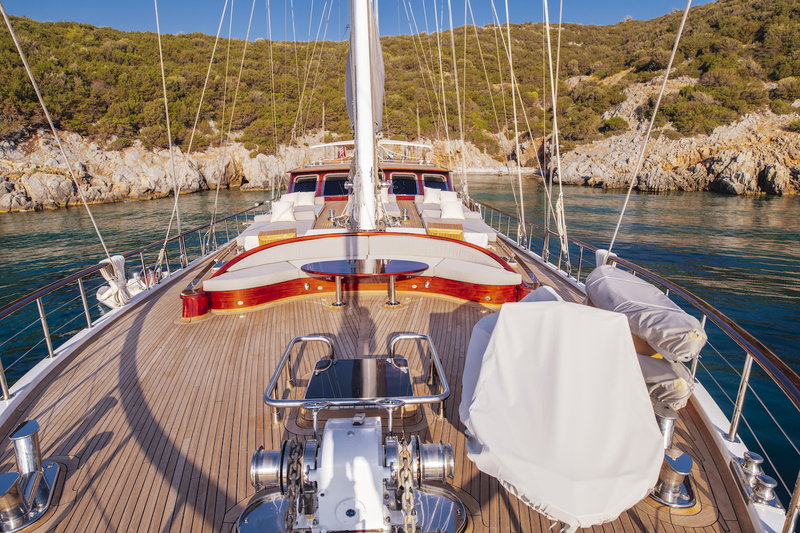 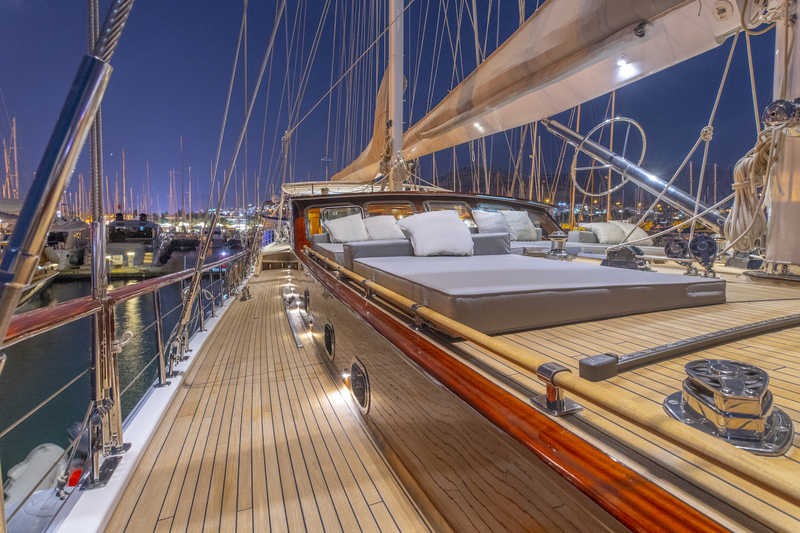 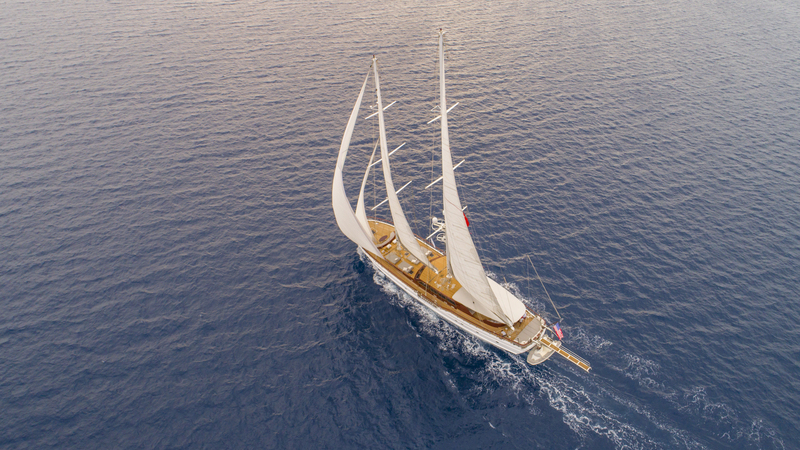 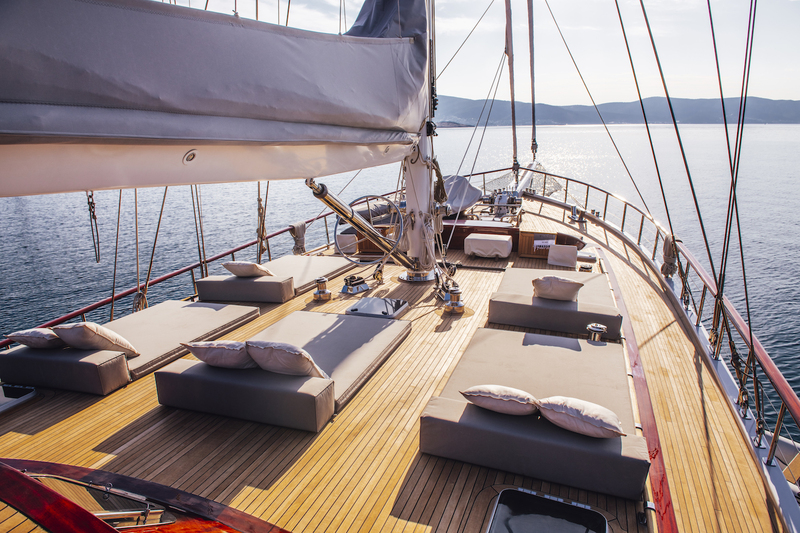 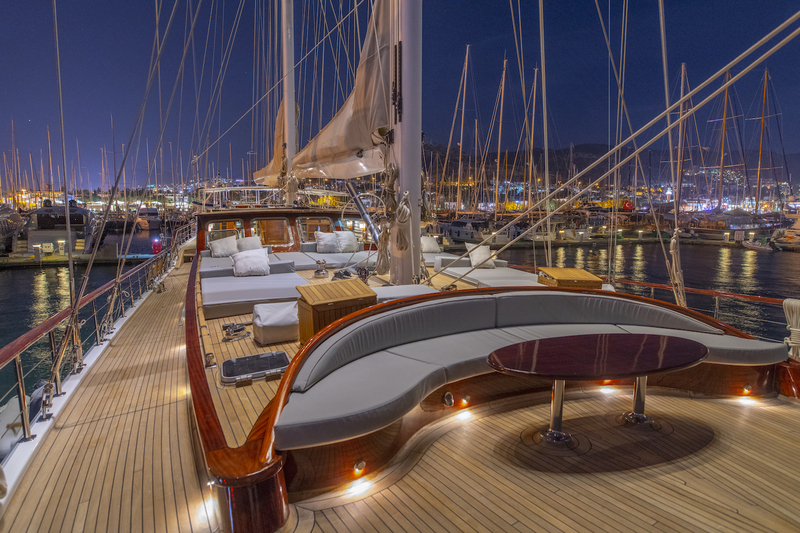 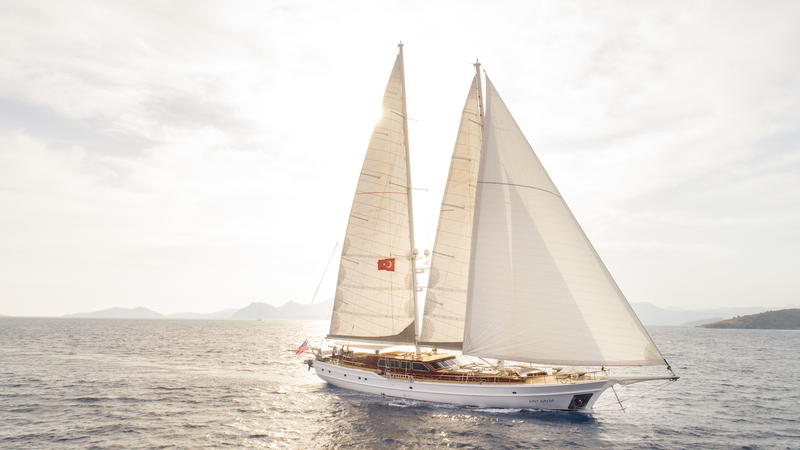 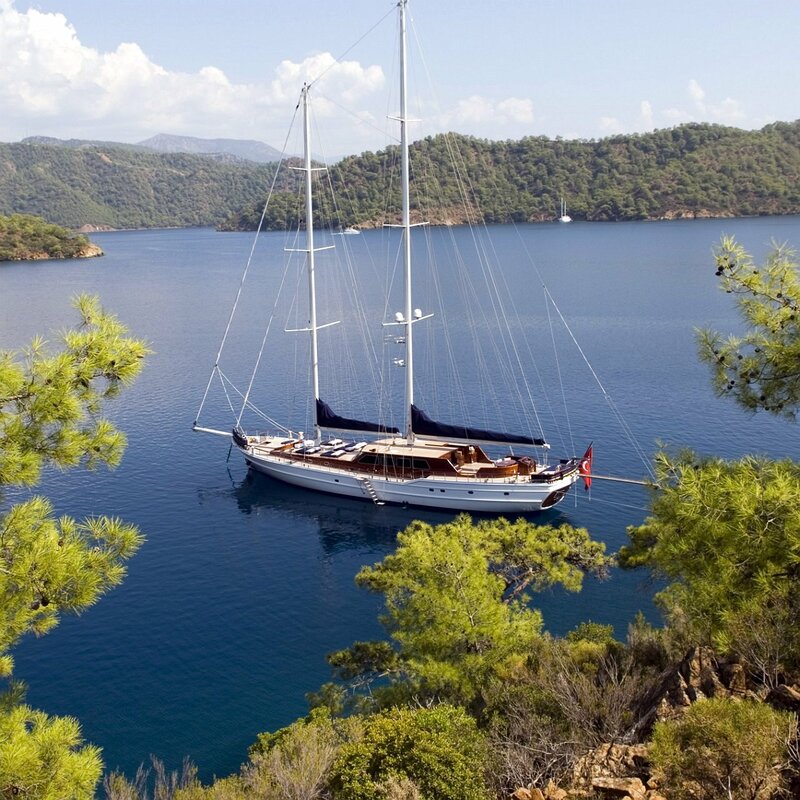 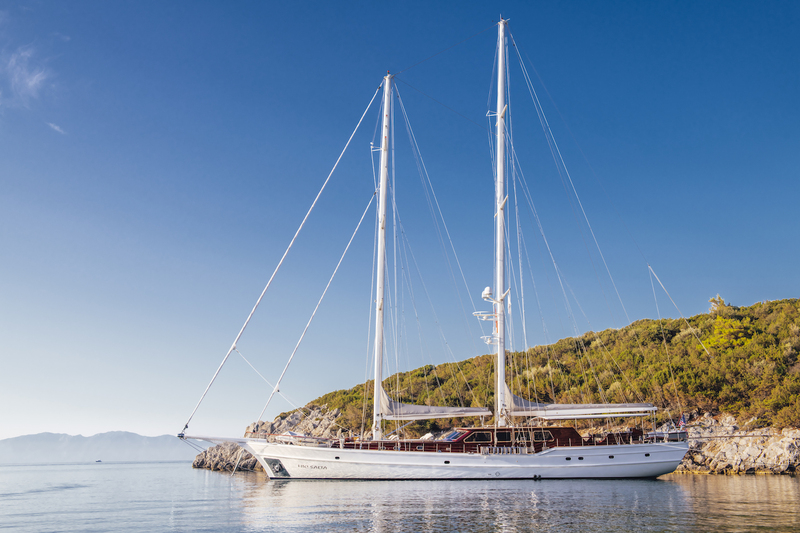 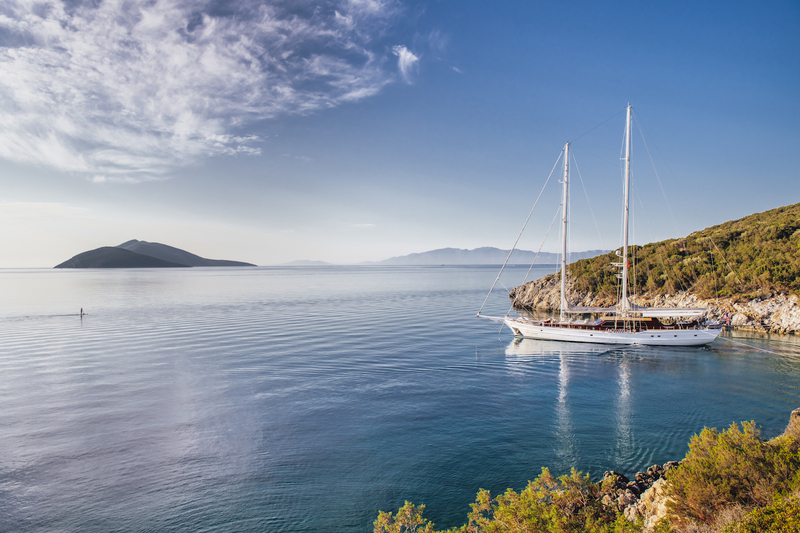 With a beam of 8m, this Turkish Gulet has vast areas of open deck space for sunbathing and lounging. 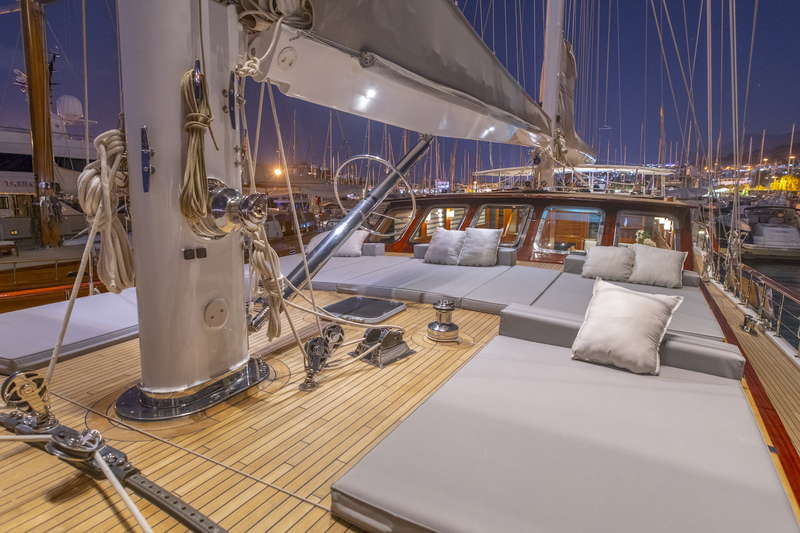 Cushions are also provided. 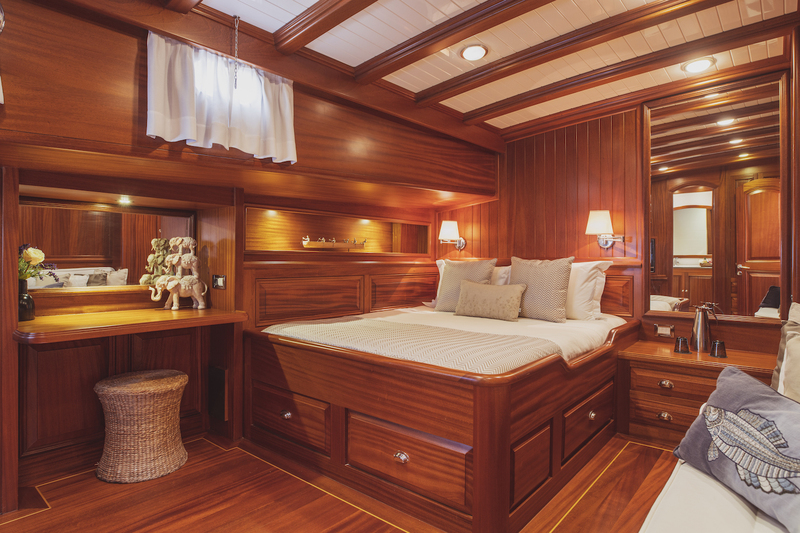 She has a delightful Spa Pool on deck and also easy access to the sea by a port side passer. 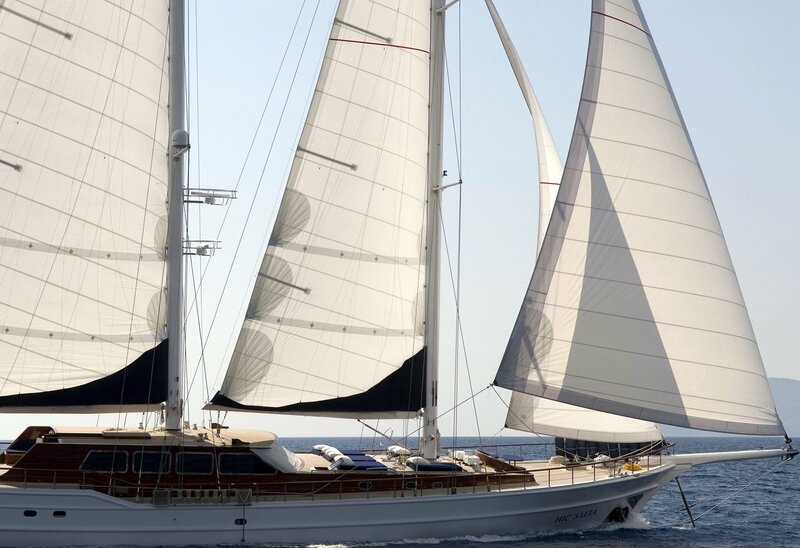 To add to the boats classical look, it was decided on a schooner rig with self-tacking booms and furling equipment for easy handling by the crew. 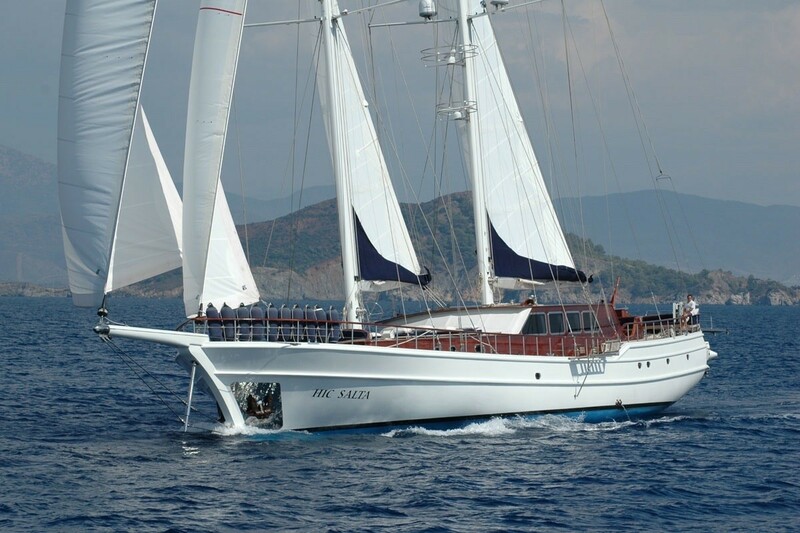 This motor sailor has a considerable sail area for efficient sailing. 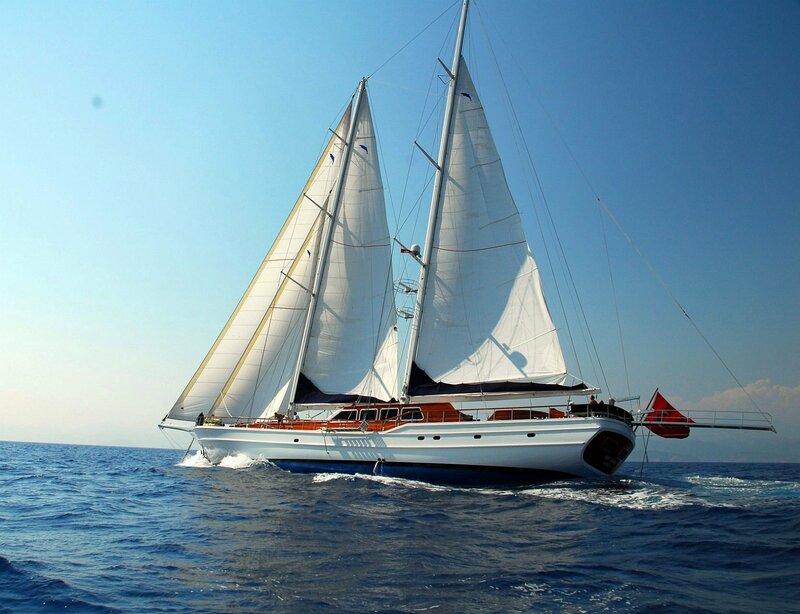 Rates listed include Rent of yacht and equipment on board; Crew’s salaries; Fuel, water and ship’s laundry; All meals and drinking water; Turkish VAT; Harbour dues and taxes only in Turkish waters only. 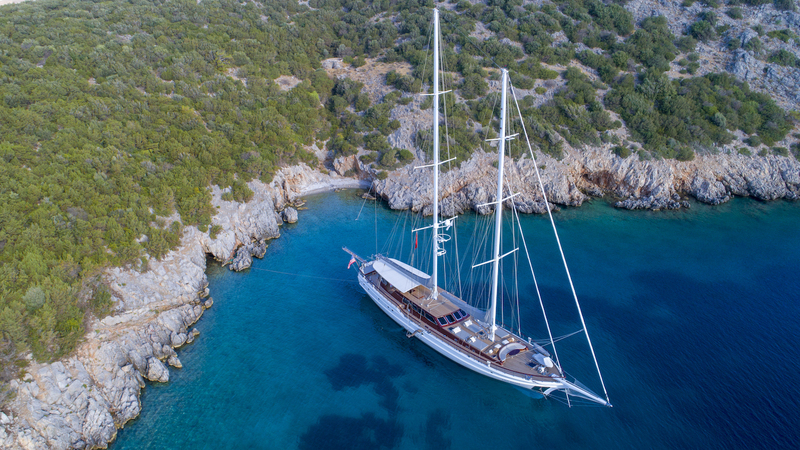 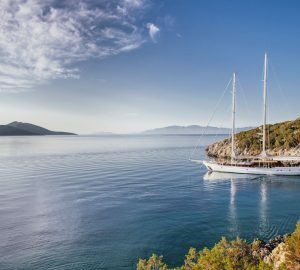 This Sailing Gulet HIC SALTA provides the following yacht charter Guest Accommodation: 5 Deluxe guest cabins each with en-suite fully equipped bathroom. 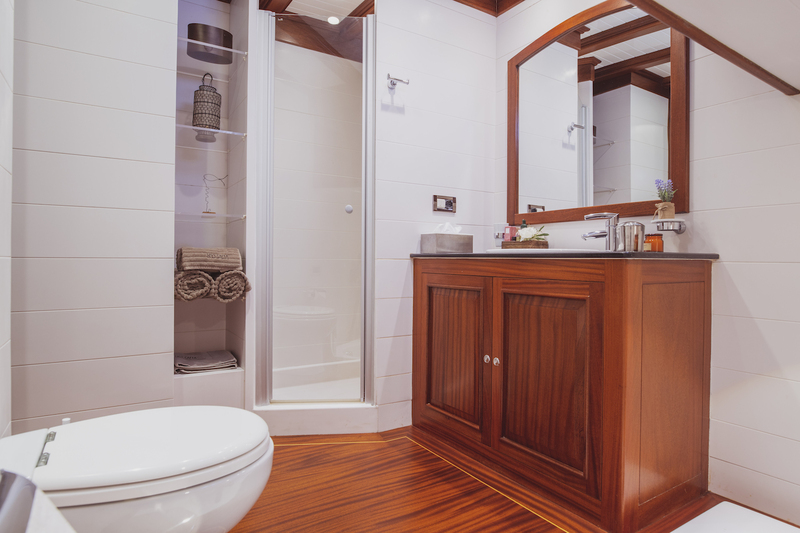 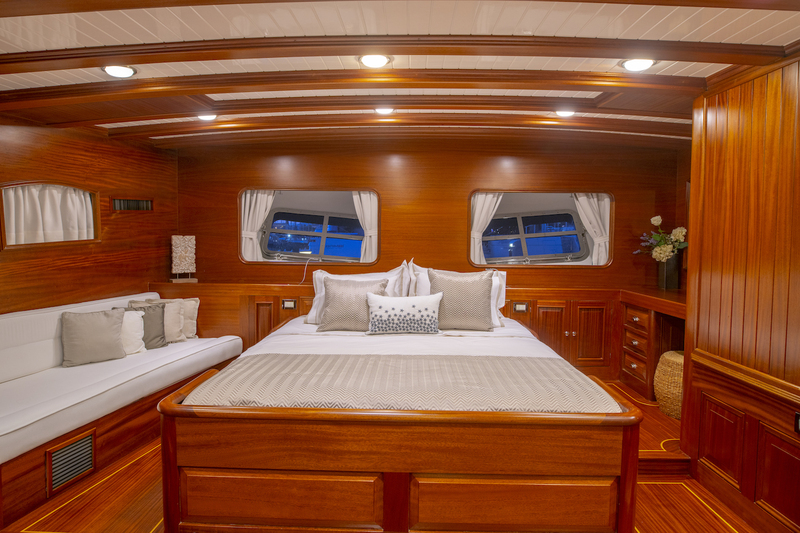 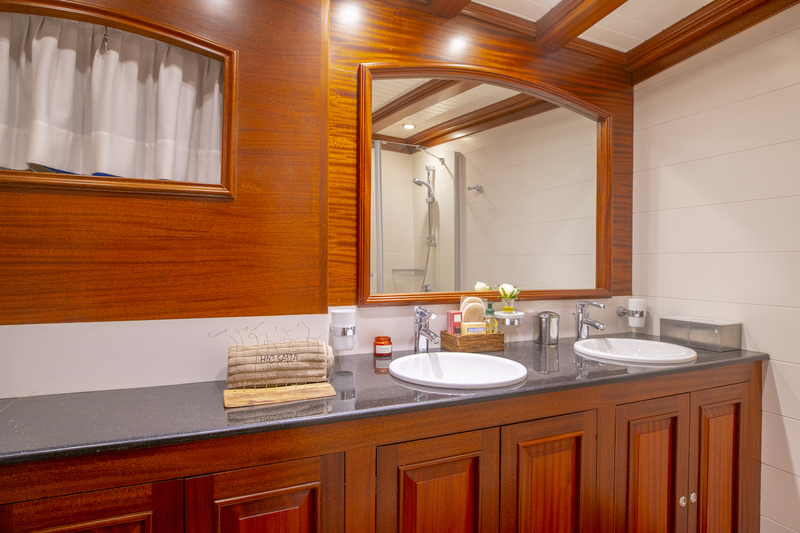 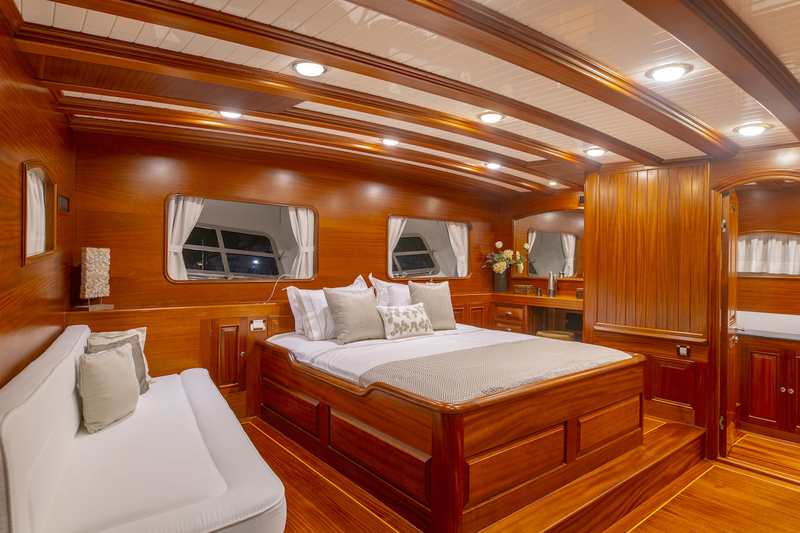 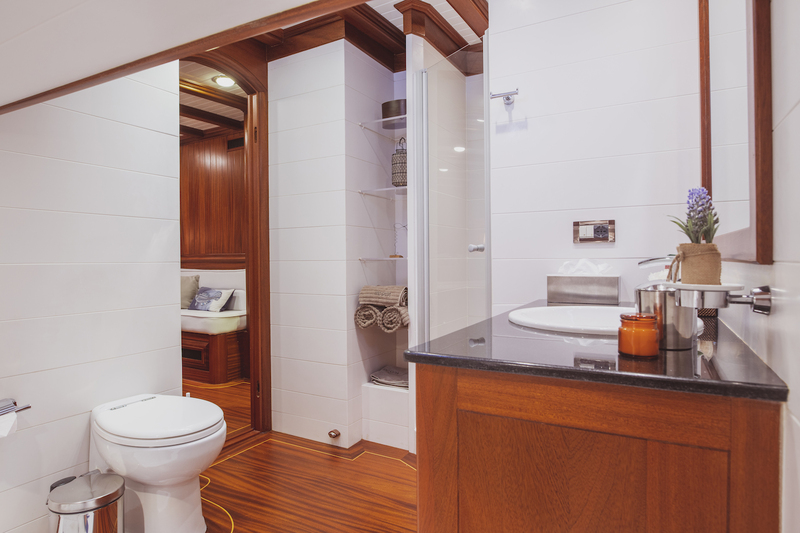 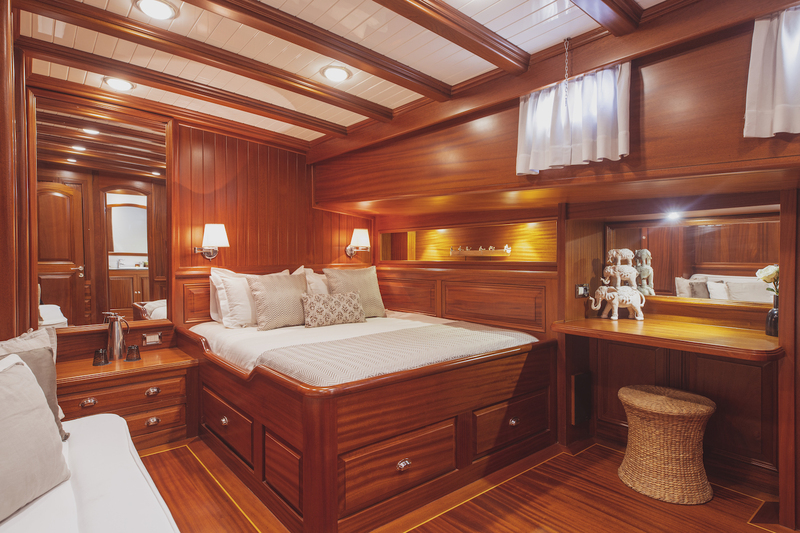 All cabins are beautifully appointed with paneled mahogany joinery and doors. 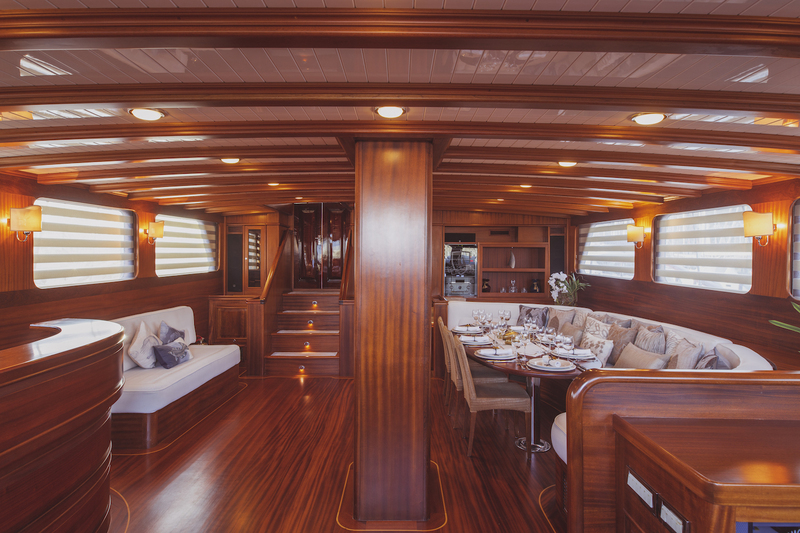 Each is served by individually controlled air conditioning / heating. 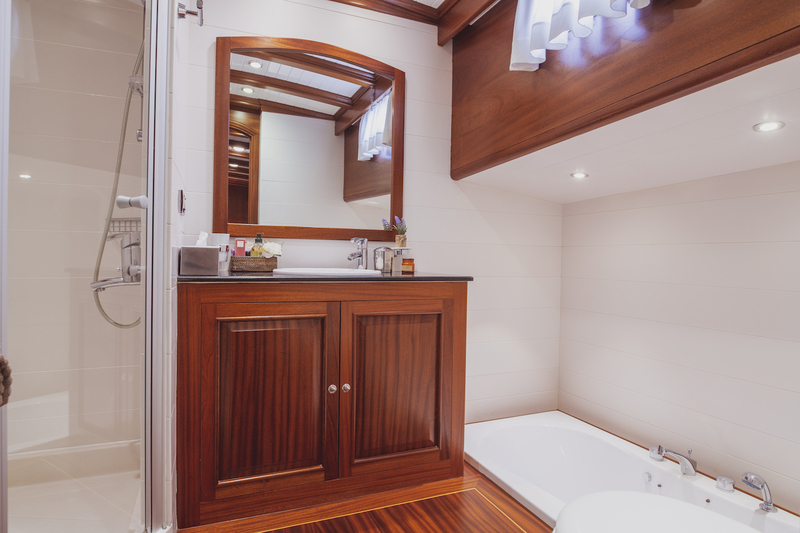 Spa Pool baths in selection of cabins. 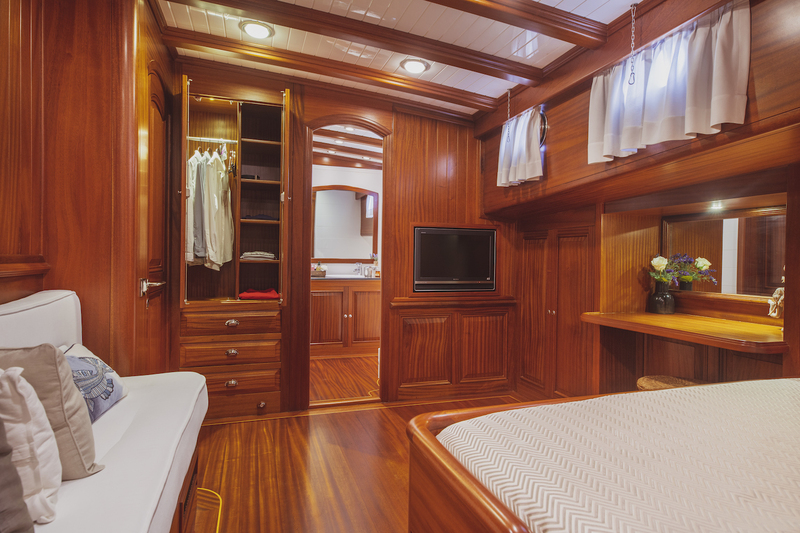 TV/DVD/VCR in a selection of cabins. 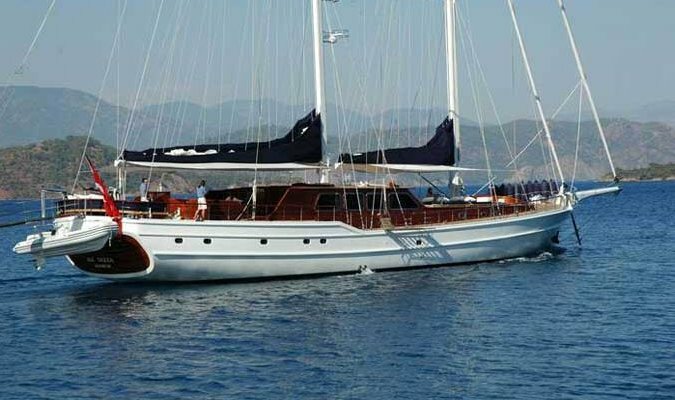 This Turkey based yacht charter boat offers the following amenities and toys: Tenders & Toys: Water Ski - 60hp; 2x Semi Rigid tenders; Windsurfer; Snorkel gear; Kayak canoe; Knee Board; Wake board; Ringo. 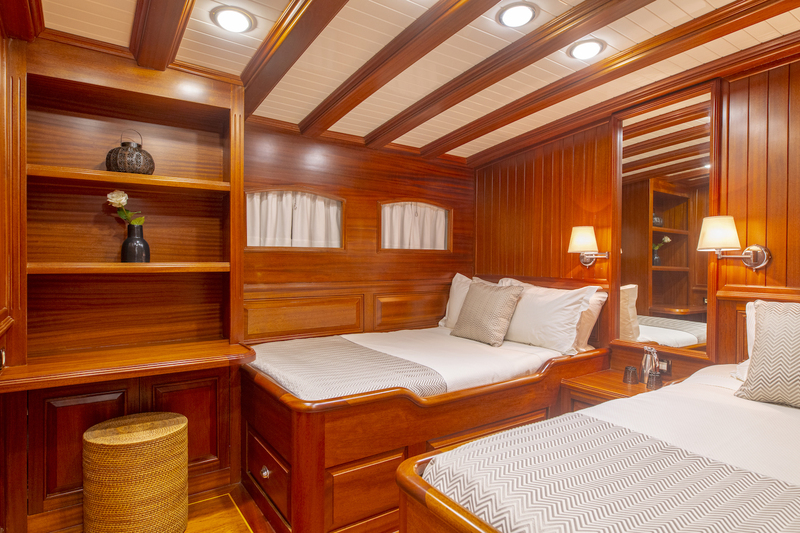 Audio Visual Equipment and Deck Facilities: Stereo Systems and TV/VCR in most cabins; Video library; Easy water access via side pasarel, Communications: VHF Ships Radio; GSM Mobile telephone and fax.